Sometimes the easiest recipes taste the best. Which can be kind of a bummer when you put in a lot of time and effort chopping, mixing, and tasting. This tastes good. This tastes really good. 4-6 steaks, or a hunk of tri-tip you cut into 4-6 steaks OR you could use an inexpensive rump roast or chuck roast. serve with potatoes or rice or french fries or vegetables or something that you normally want to eat with steak. This couldn't have been any easier, and it tasted marvelous. The kids ate their servings eagerly. We had rice pilaf as a side dish, and poured the remaining sauce over the top. It was divine. I can't believe how yummy this sounds. I can't wait to try it. Thanks. Sounds amazing. Perfect for me - I love steak but for some reason it doesn't turn out well for me on the grill. That sounds delicious!! I am going to have to make that my next shopping trip. I just made your tri-tip, feta, and sundried tomato recipe. That was so good I can't even describe...and it couldn't have been easier! I cooked mine for about 9-10 hours because we're gone all day. We have tri-tip in Indiana, but my mom had never heard of it and she's in KY. It's crazy! I don't know what tri-tip is! Whenever it has been called for in your recipes I always use some of our steaks. The feta one was very good. I will be trying this one too. Hi. I found your link on Niki's Organizing blog. It looks like you have some great recipes here, can't wait to try them out! Hi there, I should have given you a heads up that I was going to write about your site. Time slipped away and I got super excited when I found it one night. I was up until 2 reading everything. Hope you don't mind but I will be writing about your recipes quite a bit. Thanks for the inspiration to start using this nifty little tool. mom24, let me know if you do! sarah, I'm so glad that you liked the feta with the sundried tomatoes meat. We really did, too. niki, you don't have to give me any heads up, ever. that's what sitemeter and technorati are for! thank you for your kind words; I'm cooking with the mushroom soup right now, and it smells delicious. Gotta try some of your recipes. Love your blog! I made this today, and it ROCKED! I used stew beef, and thickened it with a little cornstarch at the end to serve it over mashed potatoes. We're going to a family shindig on Saturday and I was talking after dinner about making fruit salad. TheHubby gestured to the still warm crockpot and said, "Or you could make that. No. Really, you could make that." I made this for the in-laws this weekend and it was fantastic! The only thing I would change would be to make some more sauce- it was so good! Love your blog! I use my CrockPot quite a bit and I'm always looking for new ideas. For this recipe, what would you recommend as a substitute if I don't have a bottle of wine on hand? Thanks! I made this last night, it was the biggest bucket o' yum I've eaten in a very long time! I doubled the liquids to get extra sauce. Hubby flipped for it, and we've got killer lefties for lunches this week. A-MA-ZING. Thank you! Our family LOVED this recipe - I've made it again and had the same results. Delicious! My absolute favorite so far!!! So easy and delicious. This is a keeper. The link for this recipe was in a post ("What's for dinner tonight? 11-10") on a mom-only website called CafeMom, and after reading the simple recipe and all the rave reviews, I am so excited to try this soon! Should the meat for frozen for this one? This sounds so easy & delicious! Anything with dijon mustard goes wonderfully in this house. I tried this recipe last night. I didn't have any cut steaks, but I used a lean chuck roast. I used about 3T each of the dijon and A1 since it was a bigger piece of meat and it turned out DIVINELY. Everybody in my house loved it and for once there were NO leftovers. I made this today. I made the mistake of using apple cider vinegar in place of the wine. I never have any wine in my house and read that apple cider vinegar could be used as a replacement. The vinegar made it way too.... vinegary? :) Otherwise, it was pretty yummy! Do you think you can make this using "london broil" or a large round steak? socmom, sure! I would get what your family likes/whats on sale. I'm also wondering what I can use instead of white wine... we prefer reds and never have white in the house and don't want to buy a whole bottle for such a small amount. I did make it with white and gave my friend the leftover wine but there's gotta be a substitution that's just as great! CBrodnick, the wine is only 1/4 cup---I think you could swap it out easily with apple juice, or even some water. I really really really want to make this. Can I use frozen meat? Hi Krys, yes you can. The rule of thumb for cooking with frozen meat is that the rest of your ingredients should be room temp when you add them in (or slightly warmed). A 4 quart slow cooker is a good size for this meal. If you only have a huge guy, put the food in, then a layer of foil and the lid as normal. The foil will help trap the heat and moisture to prevent dryness. So I don't have any steaks but I have Flank Steak, which I love, so I'm using that. My husband is enjoying all the new variety of foods, thank you... This will be a wonderful, hearty meal for him when he gets home. He's in the military and is doing a survival thing for a couple days so when he gets home tonight around 3am he'll enjoy something warm and steakish... LOL Thanks again, we are enjoying all your meals and can't wait to get your cook book!!! Loves & Hugs to you and yours!!! I made this using bone-in pork chops. Awesome! (I did leave out the wine, though.) But speaking of wine, I have to say that I love Barefoot Wine (in your pic). I don't like most wines, but I absolutely adore their Moscato. Thanks for posting. In my crockpot right now. Excited! do you think you could put the foil baked potatoes on top of this or would it mess up the taste? I am going to try this, just thought i could kill 2 birds one crockpot! thanks! hi there, I think adding potatoes in foil is a great idea! I am going to make this but was wondering if you think I could use frozen london broil (which I beleive may be a top round steak) and if you think the time needs to be altered if frozen. a thick piece of London Broil will cook in this time period, but probably won't be as tender as you'd like. Check it after 6 hours, then cut it into a few chunks and stir back into the sauce to cook a few more hours to further tenderize. It sounded a little weird, but oh it was so good. Even my pickiest kids ate it. I made this last night and everyone love it. It was fork tender. I really want to try this as the reviews are so good - but I have no idea what A-1 sauce is???? I'm wondering if I can use chicken instead of steak... any thoughts? I'm trying this with red wine and will let you know how it turns out. Looks like such a great recipe! We were supposed to have dinner with my in-laws tonight but we are snowed in so I was scrounging for something to make for supper. I bought the ingredients for this recipe earlier this week but didn't have any meat thawed out yet. After reading the comments I decided that I would try it with frozen meat. I put a round roast in the crock pot and set it on high for 3 hours...then I will switch it to low for the remaining time. I thought I had dijon mustard but turns out it was spicy brown...so I used that instead. I got a little ahead of myself with the preparations and mixed all three ingredients together at once...OOPS! I hope this turns out other wise we may end up eating cereal for supper tonight. What did i do wrong? did exactly what it said, cooked on low for 8 hrs and my meat was dry?! Made this last night, and it was kinda bland. I used venison steak, so maybe it was too strong for the flavors. I did double the amount of sauce also. Probably wouldn't make it again. This is what I did. Layer the bottom of crock with quartered potatoes to form a rack. I use red potatoes, skin on. Pour beef broth about 2/3 up the sides of the tatoes. Place the first steak (I used T-bone) on potato rack. Sprinkle with Italian seasoning (if you don't have any around your house, you can try this: http://frugalliving.about.com/od/foodsavings/r/Italian_Season.htm), onion powder, and garlic powder. Coat with A-1 steak sauce or steak sauce of choice. Place second steak on top of first steak, repeat seasonings and A-1. Place chunks of onion on top. I cooked on high about 5 1/2 hours. You could do it on low about 8 or 9 hours. 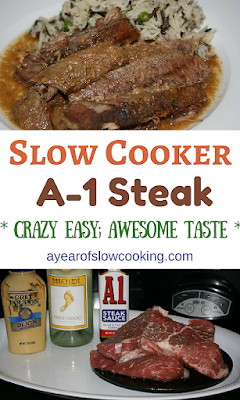 The cook time might vary depending the amount of steaks you place in your crock, the size of the crock, etc. The idea here is not to boil the steaks, which is why so little liquid is added to the crock. The steam from the broth will braise those suckers. They came out very flavorful and tender, and the potatoes were mwavelous! A great sub for white wine is a mix of half water and half dry vermouth. Lots of flavor and dry vermouth keeps well after opening. I don't know what I did wrong. I followed the recipe exactly (except I used red wine instead of white, because that's what I had on hand) and the steaks came out dry and very bland. Not good at all. Not trying to criticize as obviously lots of people have had success with this, but mine was pretty meh--the best I can say it was edible, but barely.